October brings more kits and Expos! 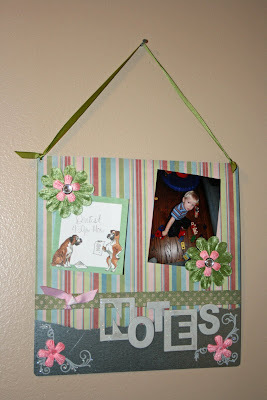 and a 12 x 12 metal message board, "Notes." 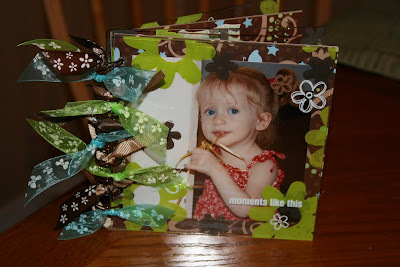 There are just a few of each of these left over from my classes during Scrap Pink this weekend. Click here to find out more. Kits2Remember products will be here at The Red Bee's booth! Get your fill of project kits, and acrylic, metal and chipboard panels! Kits2Remember products will be here at The Red Bee's booth! Get your fill of project kits, and acrylic, metal and chipboard panels! 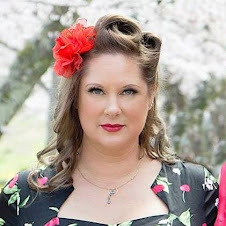 Plus, K2R's Jessica Guthrie will be at The Red Bee booth from 11 a.m.-2 p.m. Friday, hosting a make and take - come see the fun acrylic project we are going to do! I am lookig forward to seeing everyone! More details on the K2R Calendar! What do a clock and Cricut Design Studio have in common? They are both used in K2R Design Krew projects... take a look at the blog! I'm going to be in Ontario! I am so excited! 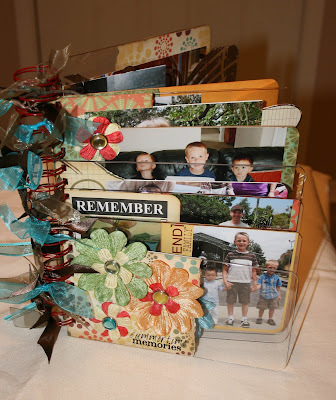 I will be in SoCal for the Ontario Scrapbook Expo Oct. 9 and 10. In fact, I will be in The Red Bee booth Friday from 11 a.m to 2 p.m. doing a make and take... stop by and see what we're creating! The Red Bee will also have plenty of Kits2Remember products, from acrylic and metal, to chipboard and kits. If there is something specific you want to get, email me at jessica@ kits2remember.com and let me know. I'll do my best to have it available for you! I am also excited about getting together with my fellow "tourists" on last year's SoCal2Provo bus tour. We had SO much fun on the 6-day long trip from Southern California to Creating Keepsakes University - Provo, we are reunited to relive the memories. If you hadn't heard about it, you can read about it in this past blog post. I am SOOO looking forward to seeing my SoCal scrappy friends! Hope to see you at the Expo! New fall-themed project kits available! I am so sorry I haven't posted in awhile, but I have been busy busy busy in my scraproom! I've created several new project kits for the fall and holiday season, as well as project samples using some of the old Kits2Remember favorites. 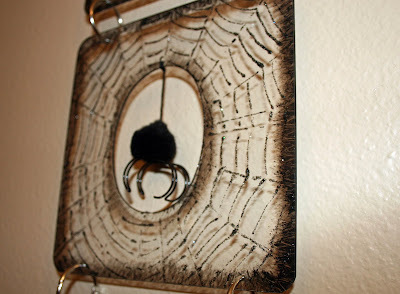 With this Halloween wall decor kit, you will get the acrylic cutout frames, materials to make the cute dangly spider and a link to the spider web pattern so you can trace it with with Black Diamond Stickles. Get ready to scare up some fun on your walls! 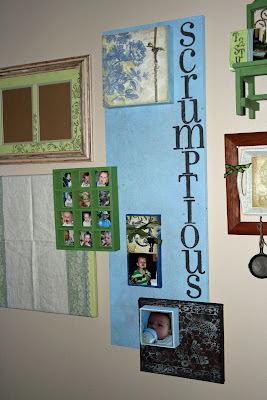 The "Family Memories" Vertical Stadium Album kit we had last year was a hit, I came out with another one: "Gypsy." I used this album to showcase summer photos, but because of it's larger size and eclectic mix of papers and embellishments, it can be used for a number of themes and events. This maple leaf autumn wall decor project is simply made up with K2R acrylic cutout frames. 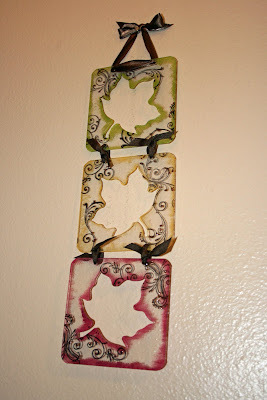 I just added acrylic paint, Stickles glitter glue and a flourish with the K2R flourish stamp 1-01 and black StazOn ink. You can get the panels in either 4 x 4 or 6 x 6. 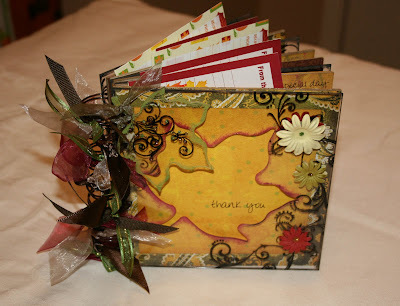 Give special thanks this fall with the 6 x 6 acrylic and chipboard book, "Thank You." 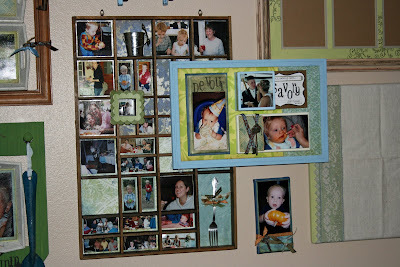 You can use this project in two ways - make a memorable album or use it to collect family recipes. Either way, it's sure to be something you can't wait to show off! Nashville CKC, half-price shipping and metal's back in stock! Kits2Remember is gearing up for the Fall season! New kits are being developed as this newsletter is being emailed out and I’m sure you’re going to love them! Is anyone planning to go to the Nashville Creating Keepsakes Convention this weekend? K2R products will be there, in The Red Bee booth. So, be sure to stop by and store up on the acrylic, metal and chipboard panels you’ll need to make this year’s holiday projects and gifts! Are you in the Pensacola area? I will be teaching three classes at Scraphappy this month, in conjunction with the store’s Scrap Pink event, Sept. 25, 26 and 27. Learn more by visiting K2R’s calendar. Live elsewhere? Get a complete list of the upcoming events on the Kits2Remember calendar. Large metal panels are back in stock. I know a number of you were disappointed that the 11 x 14, 12 x 12 and 8 x 12 sizes recently sold out. Well, they’re available in the store and K2R still has half-price shipping, no matter how much you order. These will make great magnetic message board gifts! ... I have been collecting goodies for this project for more than a year now, and it seems like it took forever to get it on the wall. While it is only about 3/4 of the way done, and it will be a work in progress for awhile, at least it is up off of my bedroom floor! 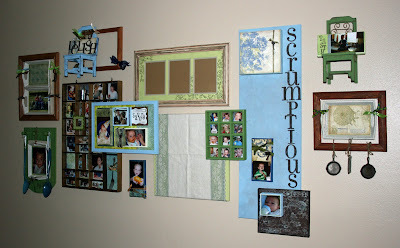 I have huge, plain wall in my dining room and when we moved in to our house last summer, I had a moment of inspiration for yet another photo-filled wall hanging. I would have theme be centered around my family eating, cooking or preparing food. To match the blue green and beige tones in my home, I stuck with much of Little Yellow Bicycle's Vita Bella line (Those of you on the SoCal 2 Provo bus tour last year remember how crazily I collected that along the way, don't you? )and mixed in some Teresa Collins, 7Gypsies, Tim Holtz, Glimmer Mist and Ranger paints and inks. Flea Market finds: Printer's drawer, miniature serving trays, tiny cast iron pans, doll-sized wooden chairs, and blue serving spoons. 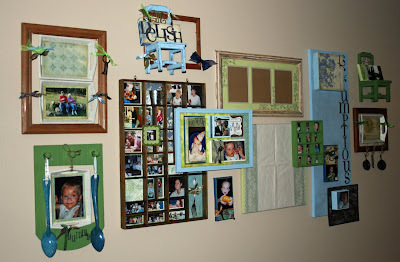 From JoAnn's clearance aisle: Frames, decorative posted cork board, framed corkboard, large square corkboard and the 12-hole nick-knack shelf. 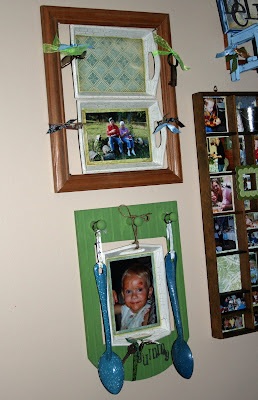 I used Canvas Concepts stretched canvas frames in all different sizes and depths and Kits2Remember stamps on the glassed frame with the three 5x7 photos. Last, but not least, I stretched a table runner my grandmother had made (the cream fabric with blue decorative border) over the large square corkboard to add a bit of heirloom feel. And, since I am such a ribbon junkie, I was sure to throw some of that up there, as well.